Mercedes-Benz will launch their debut fragrance for women (see last year's masculine scent) in April. The fruity floral scent was developed by perfumer Michel Almairac. The notes feature bergamot, peach, rose, lily of the valley, mimosa, violet, patchouli, white musk and vanilla. 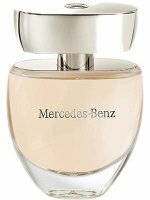 Mercedes-Benz for Women will be available in 30, 60 and 90 ml Eau de Parfum. Here’s hoping at least feminine release will be better, male one was a crappy one. I make an effort to try out any Almairac creation because he’s done some of my favourites, but I must admit I don’t have high hopes for a car-company branded fragrance. Not sure I have any lower hopes than for anything else — all made by the same people in a sense. But, don’t know much about the company that holds the MB license. I like the bottle, although it reminds me of another. Estee lauder? Ack, bad memory. This strikes me as safe and uninspiring. Too bad – this would probably be my only chance to own a Mercedes of any kind! Notes sound very sophisticated just like vera wang & if so, i may get this one. What is the point of a Mercedes, if there is no high-quality leather? Amen! An obvious, no-brainer, that would at least make me curious. The whole concept makes me think there was a very important ingredient missing from the product pitch meeting: a woman. Bottle = Elizabeth Arden Pretty.